Ebbot Lundberg, previously the front-man of not just one, but two legendary Swedish bands, The Soundtrack of Our Lives and Union Carbide Productions, is back with a superb and long-awaited new album "For The Ages To Come" and we were honoured to be able to present the first ever U.K. show for Ebbot and his new band The Indigo Children at our June Retro Man Blog Night at the Half Moon in Putney on June 24th. 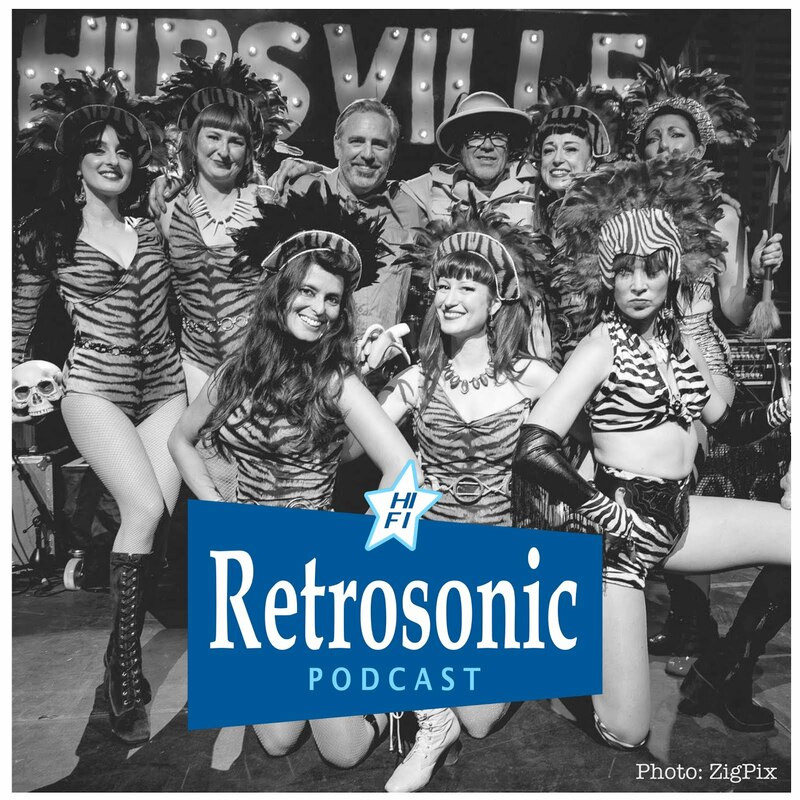 After all, the Retro Man Blog was initially set up solely with the intention to write about The Soundtrack of Our Lives and each band-member's various (and in some cases numerous) side projects and solo work. 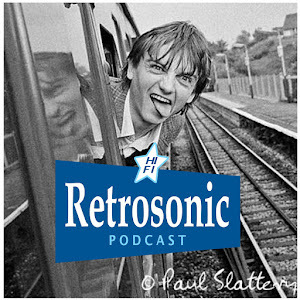 Also, the Blog was actually named after our favourite Soundtrack of Our Lives song from their debut album and no, it wasn’t because I am a nostalgic, retro-minded old git...honestly! 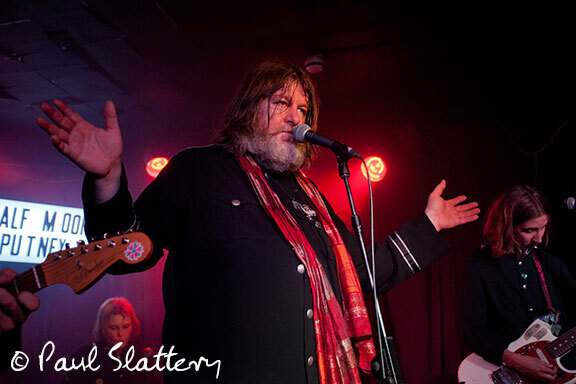 So, the chance to get Ebbot and his band over to London to appear was a dream come true and with a stellar supporting bill featuring two more of the Blog’s favourite bands, The Fallen Leaves and The Galileo 7, we were all set for a great night of Rock 'n' Roll! Opening the night were The Fallen Leaves who surprised me by unveiling a new bassist, Gareth Evans, who was actually in an earlier line-up of the band and stands in when regular bass player Matthew Karas can't make a show. Gareth was you might say, somewhat different to Matthew who is currently in the studio with his other band Glassglue. 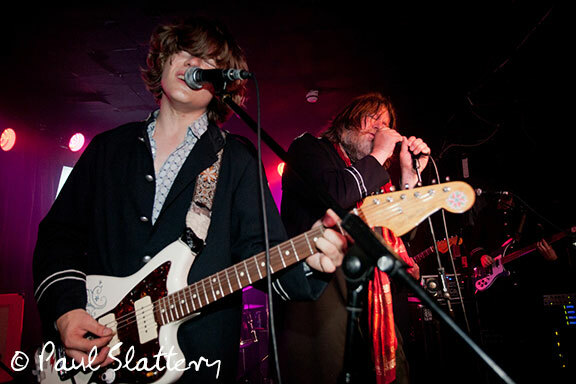 Whereas Matthew is a picture of studied cool, all suave in his velvet smoking jacket, cravat and shades - Gareth is more like a blonde Dee Dee Ramone, he's an energetic blur of scissor kicks and pogoing and it certainly adds a new dynamic to The Leaves' live show. Drummer Buddy Ascott of The Chords and The Moment is now bedded in very nicely and again adds an impressive visual presence behind his kit. The rhythm section may have been a bit new on the night but the two Robs thankfully remain unchanged. 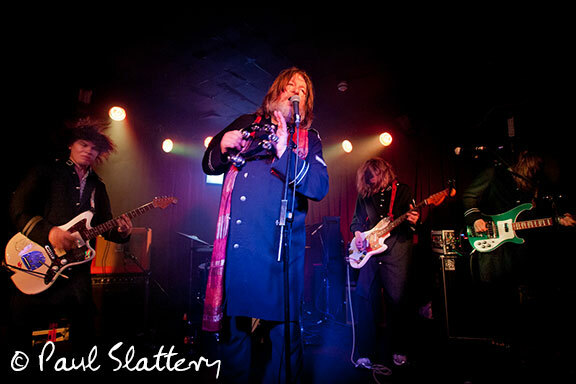 Vocalist Rob Green, pulls out all the usual tricks to keep us entertained including waving a traditional stick-seat around, blowing impressive smoke rings from an e-cigarette and of course the now legendary thermos flask "tea ceremony". 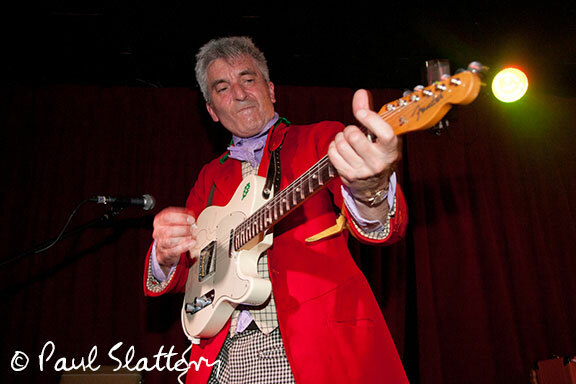 Guitarist Rob Symmons attacks his guitar with his stuttering rhythmic style, machine gunning the crowd mercilessly. The rarely played “Go Now” is a welcome surprise and a careering barely in control "Prodigal Son" almost blows the bloody doors off. 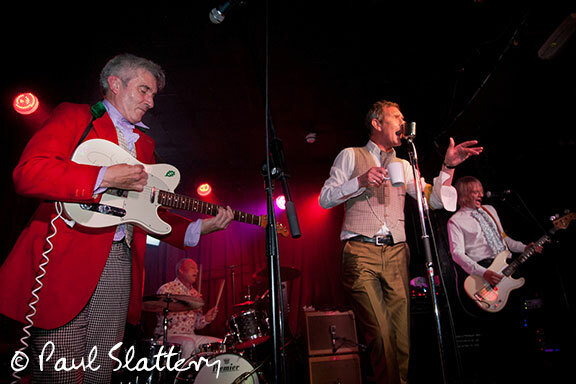 The The Fallen Leaves will be having a launch party for their forthcoming vinyl compilation album "Punk Rock For Gentlemen" at the Hope & Anchor in Islington on Saturday July 16th and they will release a new studio album later in the year. 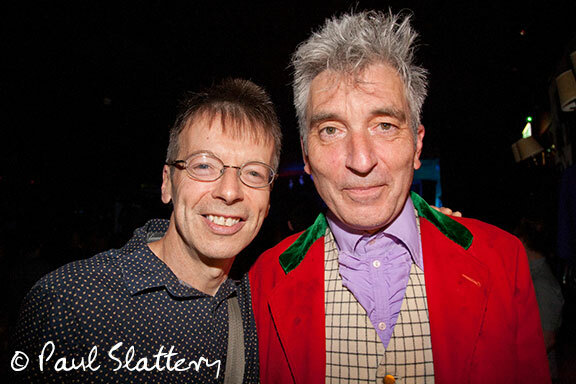 Damian O’Neill from The Undertones, That Petrol Emotion and The Everlasting Yeah was in the crowd to catch up with his old friend Buddy and Ebbot with whom he is collaborating on a new project 5 Billion In Diamonds (more about that very soon!). The Galileo 7 just get better and better and the new unrecorded songs that feature in their set, particularly "Too Much Choice", are superb and crying out to their creators to get back in the studio pretty damn quick and get them committed to tape (or whatever new-fangled digital format it is these days…! 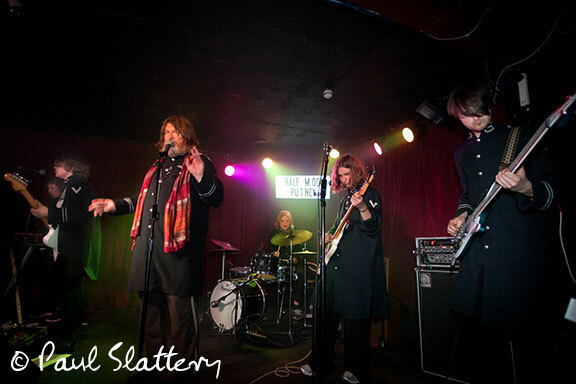 ).We know that drummer Mole is the Keith Moon of the contemporary Garage Rock scene and his energy seems to have lifted the others to another dimension. 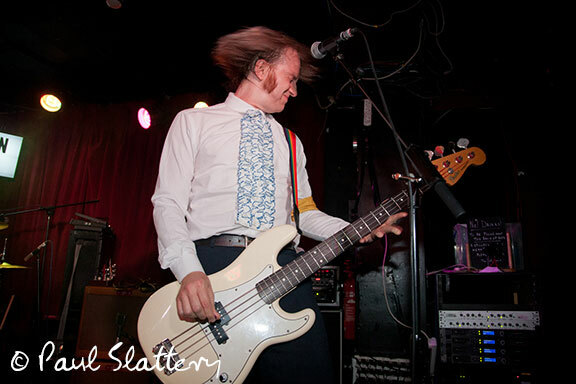 Bassist Paul Moss hauls his instrument above his head, leaping and jumping about, Allan Crockford attacks his guitar, leaping and jumping about and keyboardist Viv - while she doesn’t quite leap and jump about as much as the others - is a busy blur of activity behind the organ, taking over lead vocals on Shocking Blue’s “Send Me a Postcard”. I thought their performance at the Medway Legends Weekender in San Sebastian last month was as good as they could get, but they have taken it up another notch with tonight’s performance. There is something about the Half Moon that just brings out the best in bands – the superb sound helps. Get the band’s latest best-of-live-in-the-studio album "Live-o-Graphic" to see how they have captured the essence of the new line-up perfectly. 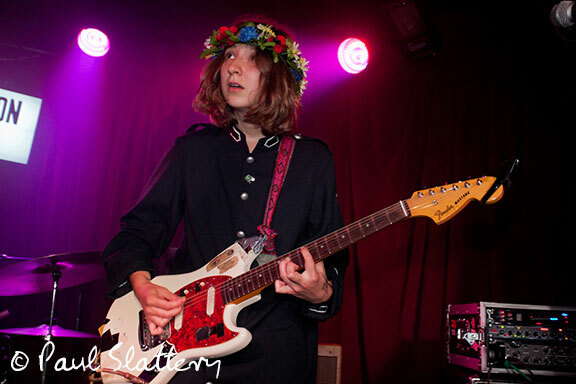 The Indigo Children took to the stage wearing their long military style tunics and colourful floral garlands in their hair to celebrate it being Midsummers Eve, a tradition they still take very seriously in Sweden. 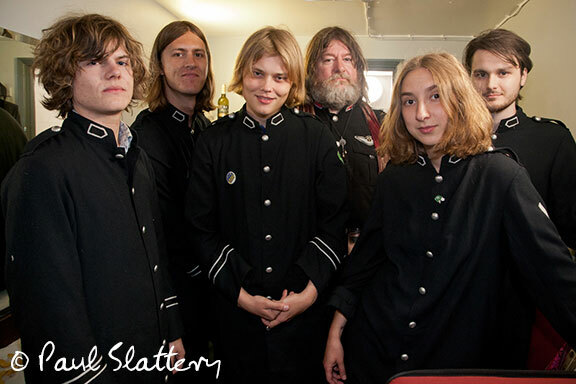 The Indigo Children are actually the young Stockholm based outfit Side Effects who have had strong links to The Soundtrack of Our Lives over the years and have often been dubbed a "mini-TSOOL". 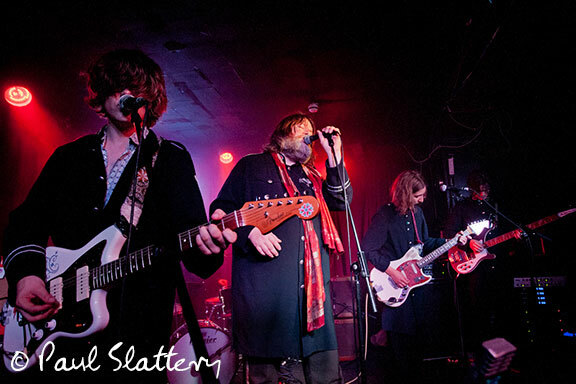 However, that is probably doing them a disservice as they have released two quite stunning Psychedelic Rock albums in their own right which are well worth checking out. 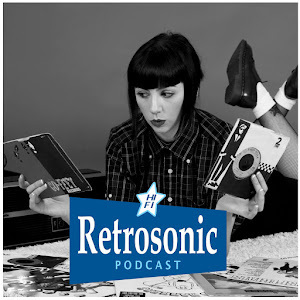 You can hear all about how Ebbot recruited The Indigo Children in our special Retrosonic Podcast interview here. Tonight Side Effects members Billy Cervin on Guitar and vocals, Elias Jungqvist on Keyboards and vocals and drummer Hugo Mårtensson are joined by bassist Oskar Nylen who was standing in for Joacim Nilsson who couldn’t make the show. Completing The Indigo Children line-up is Rebecka Rolfart from The Hanged Man and Those Dancing Days, so there’s certainly a fine pedigree and their youthful enthusiasm and mind-blowing musicianship has certainly given Ebbot a real shot of energy. The band strike up a familiar intro and I realise it’s the Union Carbide Productions classic “Golden Age” and a shiver goes down my spine. 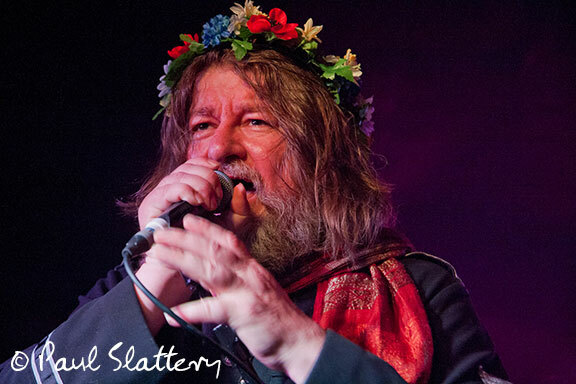 Ebbot appears to rapturous applause and cheers and the atmosphere throughout the Half Moon is positively electric. 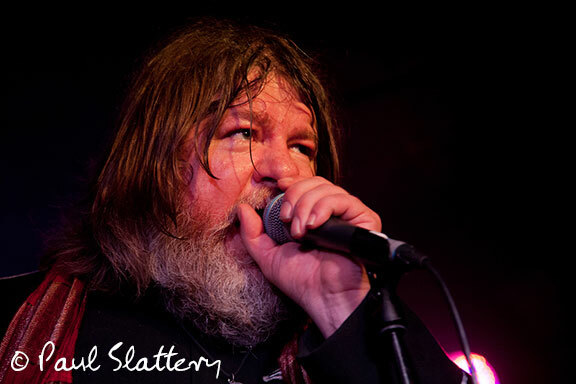 Ebbot exudes a glowing aura of charisma, there’s a mischievous twinkle in his eyes that can sometimes switch suddenly to a hint of unpredictability and danger which is utterly compelling. It’s something that always marked him out as one of the best ever front-men of any musical era or genre. “Golden Age” is definitely one of my all time favourite tracks and it’s often cited as the musical bridge between the more frenetic Stooges influenced Punk Rock of Ebbot’s first major band, Union Carbide Productions to what followed next with The Soundtrack of Our Lives’ as they delved into richer Psychedelia. 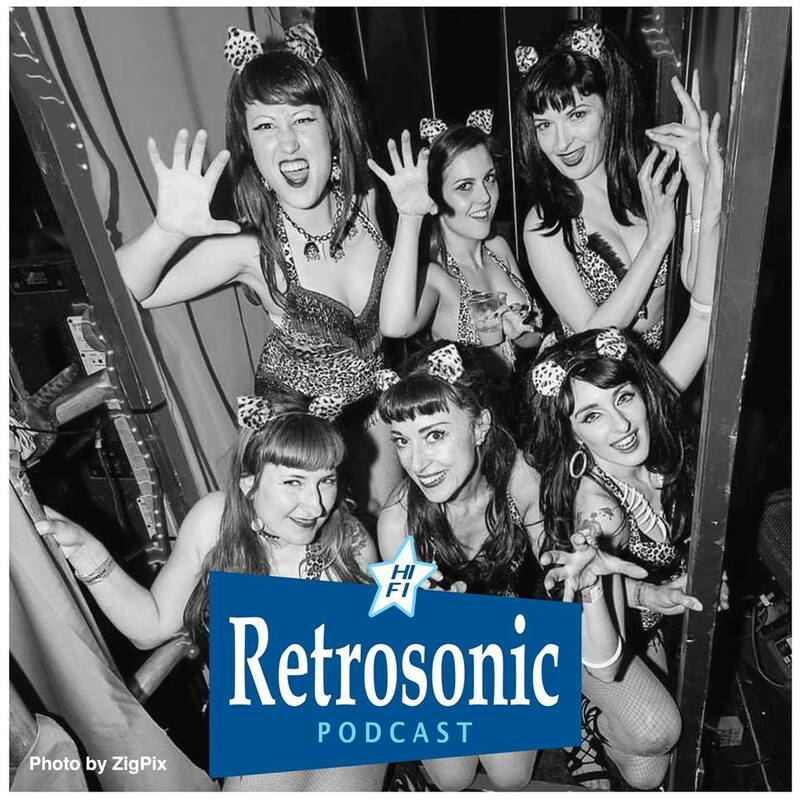 Next up is a track from the new album “To Be Continued” which is an up-tempo melodic delight packed full of wonderful harmonies. “Here I am again, here I am the only one…” sings Ebbot, staking a claim that he is now back on his own terms, freed of the constraints of a long-term, extremely close-knit band and freed of major record company contracts. “This is Hugo, he’s the boss!” Ebbot says as the drummer kicks off the intro to The Indigo Children’s debut single “Backdrop People”. It’s a stonewall classic that stands up alongside anything from Ebbot's impressive back catalogue. 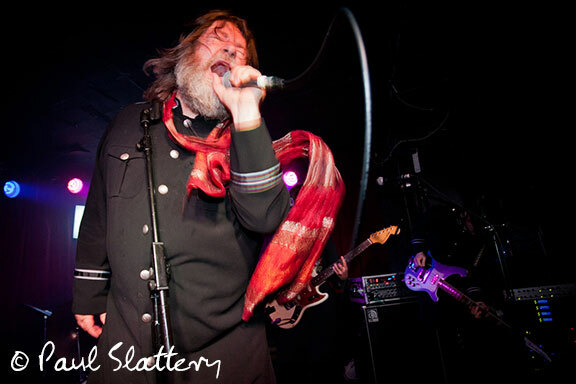 Ebbot jumps down into the crowd, he’s up close and personal, physically barging into people, demanding a reaction. 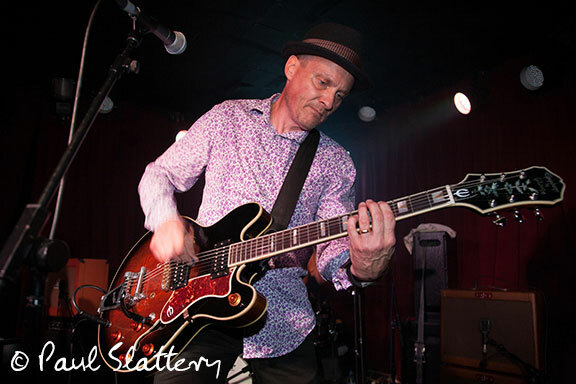 He has always thrived on that interaction – whether it’s winding up and antagonizing an indifferent crowd or feeding off the positive energy of an audience that really dig it and tonight, thankfully the crowd at the Half Moon certainly dig it. 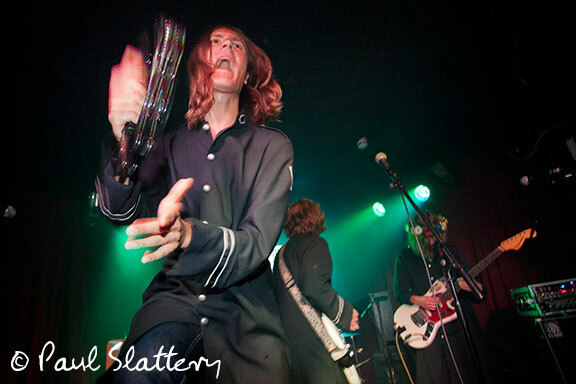 People were amazed after the show when I explained that Ebbot had actually soldiered on with a broken collarbone! You would never have believed it to witness his performance. There’s another treat for die-hard fans in the shape of Union Carbide’s “Chameleon Ride” which, as the title might suggest, takes us on a crawling lizard-like journey before slamming in hard and fast on the chorus, it reminds me of “Sick Of You” by Ebbot’s beloved Stooges. From a track influenced by one musical hero to an actual cover of another – this time Syd Barrett, and the band launch into a blistering version of Pink Floyd’s “Arnold Layne”. It’s breath-taking but there’s no let up as Hugo slams the crushingly powerful jack-hammer drumbeat to Union Carbide’s “Glad to Have You Back” which is undoubtedly one of the highlights of the night. Next up is another cover version, but one which The Indigo Children have pretty much made their own. "Calling From Heaven" is a remake of Los Pekenikes "Cerca de las Estrellas" which is an intriguing mix of Arthur Lee and Love styled Psychedelia mixed with Latino and Tex-Mex flavours. The new album’s excellent title track “For The Ages to Come” highlights Ebbot’s rich baritone and gives us a bit of a breather before Ebbot is down in the crowd again during the crunching take on “Don’t Blow Your Mind” from Alice Cooper's 1960’s Garage Rock outfit Spiders with a freak-out ending that throws in a bit of Union Carbide's "Ring My Bell" for good measure. With Ebbot down in the crowd, Elias spots the gap at the front of the stage and leaps out from behind his keyboard with a mic to take over lead vocals and there’s a nice moment when him and Ebbot duet together, Ebbot down in the crowd looking up admiringly at his young band-mate who affectionately pats him on the head, before helping him back up on stage! Considering this was Oskar’s first gig with the band on bass it was a stunning performance. 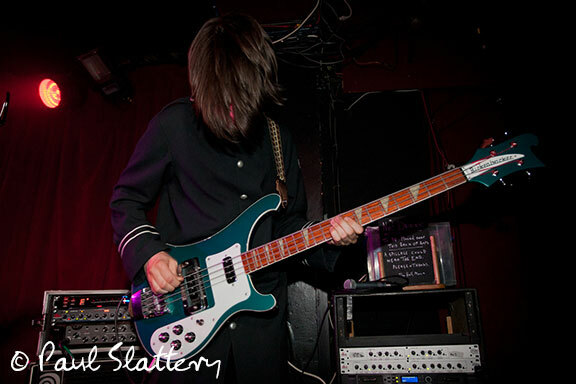 Half hidden behind his floppy dark fringe he played his cool black Rickenbacker bass to perfection, nobody could believe it was his first show and he did regular bassist Joacim, proud. 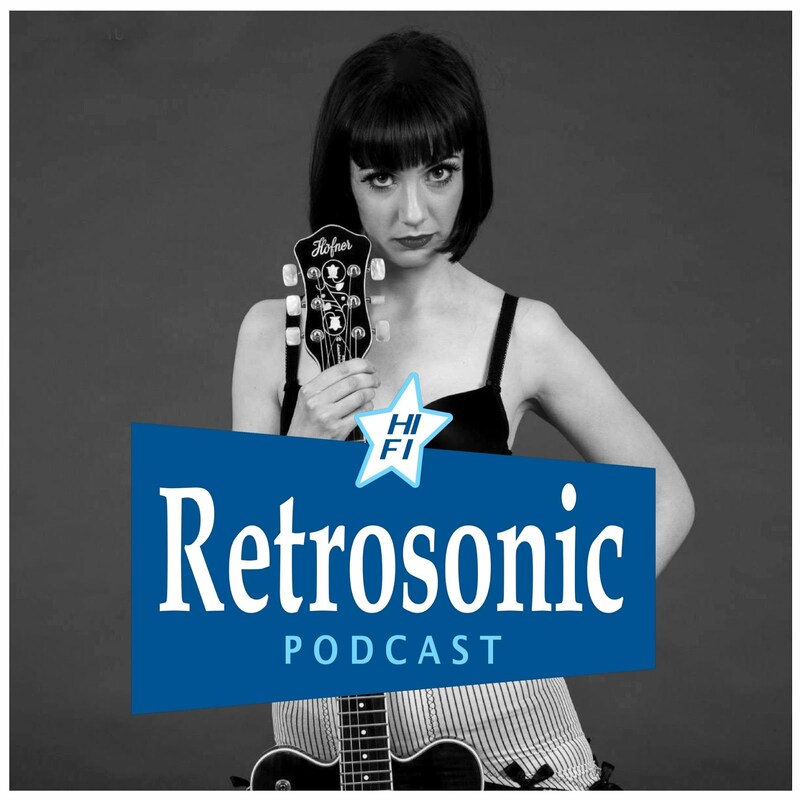 Rebecka on rhythm guitar adds some wonderful texture to the songs and later on Ebbot was particularly full of praise for how she had fitted in with the band. Rebecka charmed the crowd with her floral garland and easy smile and certainly won a lot of admirers. Lead guitarist Billy had free reign to impress the crowd with his immense guitar work, leaping around the stage with a confidence that belies his youth. 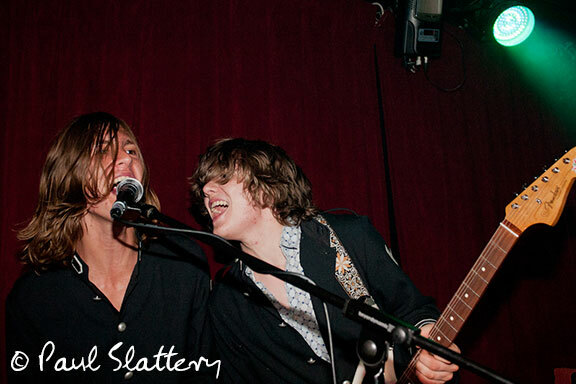 He also adds some wonderful backing vocal harmonies throughout the set and is an undoubted star. Behind his drum-kit Hugo reminds me more of a Jazz drummer than a straight ahead Rock drummer just thudding his way through the songs. None of that for Hugo, he has an instinctive grasp for what runs through Ebbot’s often spontaneous mind and steers and adjusts the songs expertly. Actually, come to think of it, all three drummers were exceptional tonight. 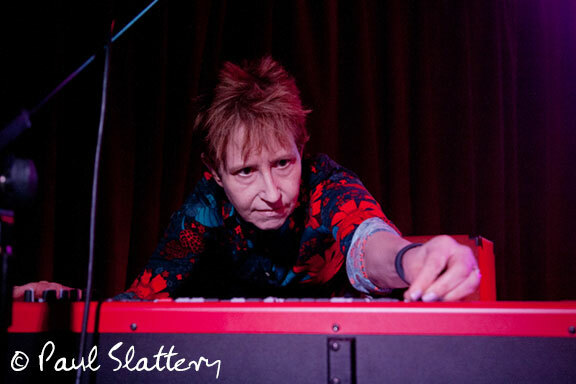 Keyboard player Elias has a huge smile and clearly thrives being on stage – grabbing every opportunity to break free of his keyboard and join in the action at the front, bashing a tambourine, clapping and singing along. It’s this dynamic stage presence that takes your breath away, despite the new album being more akin to the early pastoral Psychedelia of TSOOL’s “Extended Revelations” album, live the band are a completely different proposition altogether. People are almost pinned back against the walls of The Half Moon as the band do what all good Vikings should do and invade our territory! The sheer force of energy takes me back to those immense Soundtrack of Our Lives gigs where the combined visual assault of The Who and The Clash were packed into that glorious Swedish six-piece. 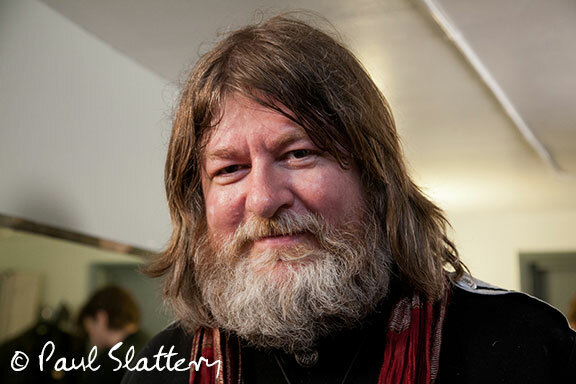 Just like TSOOL, each of The Indigo Children has a distinct personality and it is credit to Ebbot that he allows them to flourish; this is a proper band not just a collection of session musicians backing a solo singer. "I See Forever" has become a firm favourite ever since I first saw it performed for the first time last year. 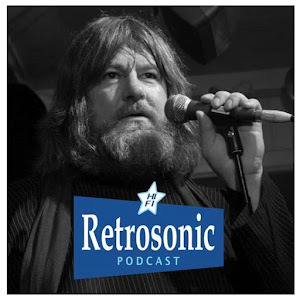 It’s a beautiful song and if it has a few familiar strains to it that’s probably because it is actually an old but previously unrecorded song written by Ebbot together with his old band-mate Björn Olsson. The set finishes with The Soundtrack of Our Lives latter day classic “Second Life Replay” from the “Communion” album, a complex track that builds to a crescendo and it is a perfect ending to a stunning set. The encores bring two more TSOOL tracks and the mood shifts to take in the heart-wrenchingly beautiful “You are the Beginning” and the equally emotional “The Passover” which stretches to a ten minute sing-along that leaves the crowd with a few tears in eyes and lumps in throats and baying for more. 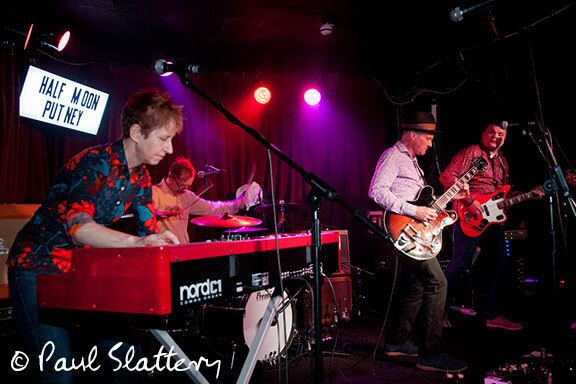 Here are some more of Paul's excellent photos of the gig, all copyright Paul Slattery 2016. 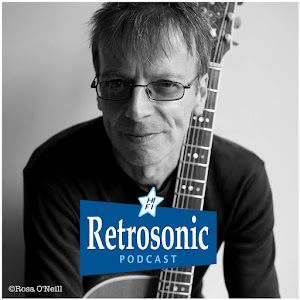 Don't forget our Soundtrack of Our Lives fans group on Facebook where you can share photos, videos and memorabilia and keep up to date on what all the band members are doing. You can join up here. 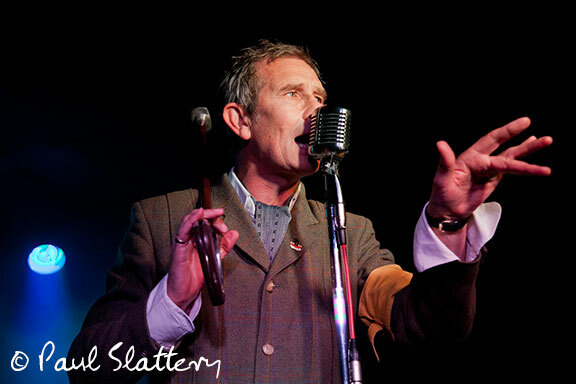 See you back at the Half Moon on Friday September 16th for Graham Day & the Forefathers with The Len Price 3. Advance tickets available now from the Half Moon here.